At 350 Watts the TSDZ2 delivers the basic needs of a decent pedelec system without overstressing the frame or drivetrain. Could be Catrike friendly. There is a story behind this drive. My wife reluctantly approved a drive as long as it was lightweight, under 10 lbs. We got pretty close to that anyway. TSDZ2 ships with a 42T chainwheel and can fit 2 110mm BCD chainrings. It was fitted with a 34T and drives a 36-11 Cassette on an SRAM DD3 hub. 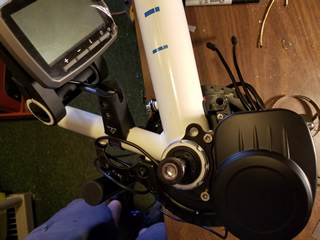 The SRAM Click-Box is connected to the Shimano Trigger shifter on the left side. Fitted with the VLCD5 Display and Remote on lower side of left bar grip. Her original 150mm Cranks are installed but some pics may still show the triple rings on the right crank. Relatively easy installation once you get past the cable length issues. For some those are minor, for others a problem. I was told by the Tongsheng Factory Rep that they could be custom lengths on a bulk order. BTW, I ordered this directly from the factory and told them I would be publishing a report. June 2017 we spent the month riding bike trails in Utah, Wyoming, Idaho, Montana, Oregon, California, a nice test for the TSDZ2. Our typical rides would be 2 ways with a net climb of 800-2200 feet over 20-40 mile rides. Our average moving speed is 10-12 MPH and we don't exceed 20 MPH ever. 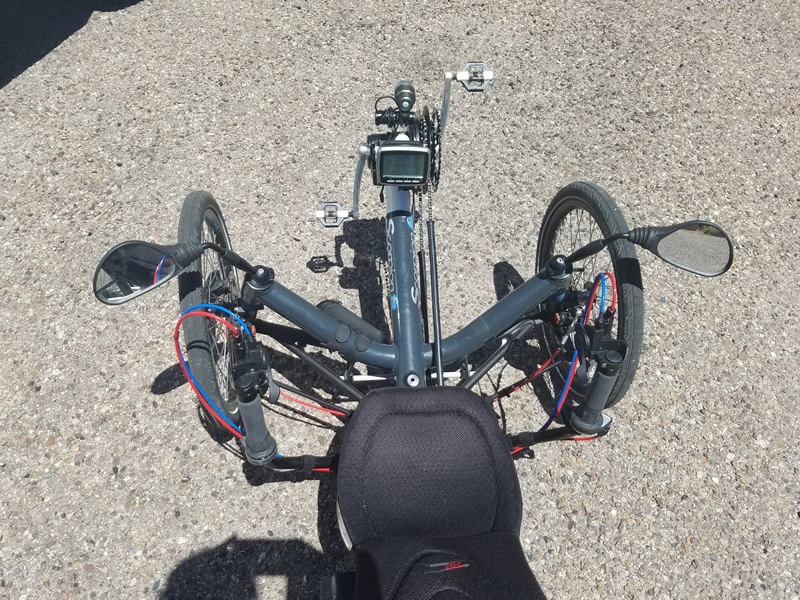 That said, pedaling uphill for 10 miles on a trike can be rather grueling, especially when you really want to go 10 more miles uphill. We did find limits. 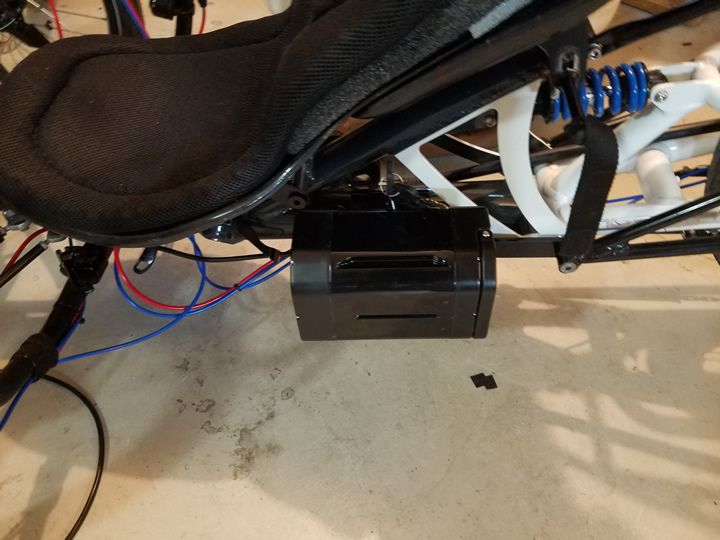 Power comes from a compact 36V - 8.4Ah 10S3P @ 4.3 Lb battery case by BIX Power. The theory was that using best efficiencies in control (Torque Assist), motor (Mid Drive) and limited peak power (~ 480 watts peak) a small battery would go far. Battery came with a charger and a pair of 16 AWG (teeny!) power wires. Then again with a 13 amp peak, 16 ought to just due. Takes 3.5 hours for full charge. There is a robust battery locking mount, at least pretty stout for ABS. Fitting the mount to the HPV was almost easy. A simple aluminum bracket (11" x .25" x 12" barstock) that mounted between the existing battery mount provisioned by HPV. All in, $365 for a battery & mount. Tongsheng TSDZ2 Motor set for 36 volts. Maximum measured current draw was a bit over 13 Amps. Its rated at 350 watts, but for peaks it will give a short burst of 480 watts, then drop to about 12 watts. Like the battery, power leads are lightweight 16 AWG. With cranks, no pedals, wires, VLCD5, & Remote total weight was 8.9 lbs. The TSDZ2 was installed in a spare boom. Net weight difference between the two booms was under 6 lbs. Internally there are 2 sets of reduction gears, similar to the Bafang. Its reported to have up to 40 NM peak torque and it feels like its closer to about 30-35 NM. Double reduction gears take a while to figure out and they've had some "teething problems" (literally) in early production, but seem to getting past the worst of it. That's normal for new Mid Drives as there are more small parts packed inside a tidy envelope. You can add a throttle but it would be a waste. The torque follows pedal input just enough that it's smooth to a point. The 36V is limited to a cadence of about 78 RPM where it drops off to about 0 power at 100 RPM. That's not the speed limiter, its just not going to spin much faster. The 110 BCD chainring can take 2 chainrings, and the offset works well with fat bike front derailleur's. This motor is all about low cost efficiency that's easy to install. Nothing else comes close to price point and simplicity. VLCD5 display with Remote makes you want to pull real hard on the short wires so the long wires will get pulled back in. Like the Speedo cable, the Remote needs to be extended if you want the display more directly in front of you. Everyone prefers something different. Excess VLCD5-Motor cable can be looped and hidden. I used JST Connectors from Grin Technologies. Mounting the LCD on the Derailleur Post on a cheap T-Bar; used some 1" PVC tubing to shim the LCD rings to fit the T-Bar. Power cable to the battery, speedo cable, and remote cables are tied to the FD cable mounting points. VLCD5 swings down for folding. Programming the display takes some time to figure out. Endless Sphere to the rescue. Not to bad to set up. Like most voltage sensed battery monitors it's not reliable but otherwise its a nice legible display with good presentation. It comes with 170MM Square Taper cranks, and a tool for tightening the nuts on the BB barrel. There are a handful of sources, mostly in the far east, that will deliver to you a TSDZ2 drive package for between $375-$425. Sometimes a little cheaper if you don't mind waiting. A turnkey Torque Assist system for under $800. Power output is pretty smooth although at higher cadence you find your self out of synch with the power refresh on the motor; it seems to synchronize power on the succeeding half turn based on the human power from the preceding stroke. It takes a little getting used to, but only at high cadence and low-medium leg power. Very responsive, yet not reactive. Off Mode has a very slightly noticeable drag and audible gear noise. Some units more than others, and after about 500 miles the gears tend to bed in and quiet down a bit. But you'll always hear them. Much of the drag is coming from a large seal which does the job it's supposed to do at a price that makes the kit affordable. Same for the gear noise. For the not so techies, the gear noise is due to selecting a profile that's easy to manufacture, and very strong. Not an easy task when its the highest failure part in all Mid Drives. The gear noise was downright annoying for the first 200 miles. After about 20 miles I added some Kluber Gear Grease and that helped, but took another 250 miles to bed the gears in. Feels like it has as much drag as the Golden Motors Smart Pie Hubmotor, maybe more. Eco Mode at 33% boost rolls on and off more gently and has a subdued level of power. Keeping a little easier pace on the flats is about its useful for. 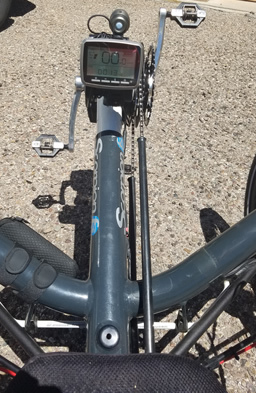 Tour Mode at 100% boost is more responsive and works well to cap an easy flat speed at about 15 MPH, or a 1-3% grade at 7-8 MPH. Speed Mode at 300% boost makes 20 MPH on the flats achievable, or 5-7% grades at 7-9 MPH. Speed mode can be a bit difficult to adapt to at first. You're limited in output so the motor reaches maximum boost at about 120 human watts in. Most folks can short burst twice that so under muscle it feels like the motor falls off a little prematurely. Not a bad thing, a thing you get used to. Turbo Mode well, not really sure. Been told it gives a short 400% boost. That may account for the 13 Amp spikes from 12 Amps. Which means the boost is so small you barely feel it. As a tool to climb hills the TSDZ2 performed better than expected. Set to Speed Mode climbing at a steady 7% we averaged 9 MPH. Just enough speed to get some airflow. Normally we would be averaging 3 MPH up hills like this, and worn out at the summit of each ascent. 350 watts in a mid drive is just enough to be practical for many. Over the first 100 miles we pretty much did 10 mile rides with recharging every 2nd-3rd ride. Battery has an indicator on the side that seems accurate, probably linked to the Battery Management System. Our rides include about 500 feet of climb every 10 miles. Discharge rates worked out to about 4.5 Watt-Hours (WHr) per Mile. Considering a usable level of 240 WHr we see about 53 miles range. Keep in mind the power is mostly used to climb hills. Otherwise pedaling preferred. Imagine a halfway fit middle age guy on an upright climbing hills on the MUP. We could keep up and sometimes do. The next 300 miles were through a few premier northwestern rail trails with plenty of elevation changes. Worst case range was 34 miles with a 2048 foot ascent, about 7.0 WHr/mile. It is a highly efficient system that in total weighs about half of a hubmotor system. If we lived in Dallas, range would be double what we see in the hills. If you can reach 20 MPH on the flat, 350 watts will boost you to 25 MPH. The faster you go the much more power you need due to aerodynamic drag. Its kind of self regulating with 350 watts. On the other hand if you quadruple your total power output for climbing bursts you'll be tripling your climbing speed. You'll not be wasting time on the worst part of the journey, in fact you'll actually look forward to hill climbs! Your range will increase by 50-100%. The good news is those small batteries? You can always buy a spare and put it in a pannier. What's not to like about an $800 Torque Assist System? Audible Gear Noise. This is the loudest assist system we've heard, and we've heard quite a few. To the ears of one who's got "perfect pitch" with gear sounds its downright brutal. After removal of the side case an investigation of the secondary pinion gears indicated noise is a permanent thing. Of course my "Fixit" mind momentarily intervened with "how about a belt drive at a lower ratio like 4.5:1 rather than 6:1. $$ Plink plink. Then its on to FET's etc. Naw. Only one thing not to like about an $800 system. You don't have one yet. If you're ready for a little boost on hills, or need a little more speed to hang on with some upright friends this motor will do it. Your roadie friends will have preferred you chose a Magic Pie. Your range and enjoyment will both increase. Its by far the easiest to install. Most folks install the LCD on the left bar which kind of renders the remote useless. Not a bad thing, one less thing needed. ICE and Catrikes may be able to use a TerraCycle Battery Mount. The next step up in Torque Assist is about double the price.